This summer, explore beyond the usual events. Discover the history and stories in your own backyard. 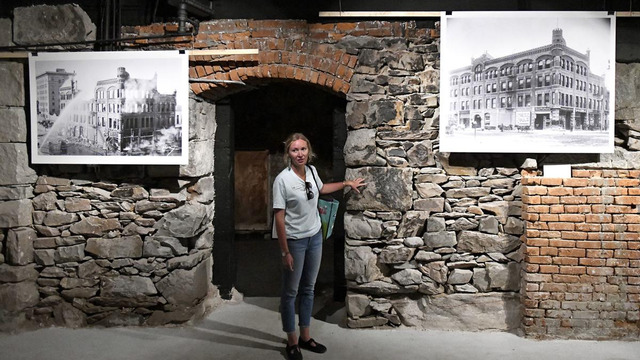 Many cities are now launching tours of historic cooridors and cultural areas to help engage its residents and visitors, to make spaces meaningful and locations remembered for more than the sunset or the good shopping. Next Exit History has partnered with the Downtown Missoula Partnership and the Hidden Kalamazoo Tours to provide additional content for locations no longer accessible and to provide a glimpse into the past. As summer begins and more folks are visiting our downtown in Missoula, Montana, the Downtown Missoula Partnership is launching an ambitious program highlighting our heritage. We’ll begin by offering two guided tours of the downtown twice a week in conjunction with a regular Thursday night downtown program and our Saturday Farmers market. Both tours, one of selected “underground” locations that we call” Basements and Back Alleys” and an additional tour along our historic river, are accompanied by companion digital tours in Next Exit History. The program entitled “Unseen Missoula” seeks to acquaint both residents and visitors to the rich and unique history that encompasses our downtown core. Guides will lead tour participants through 6 separate downtown structures that were utilized as commercial establishments. In one interesting basement that was used to store Civil Defense supplies during the during the 1950s and 1960s, the remnants of those items are still visible. On the mile-long guided tour along the Clark Fork River that weaves its way through downtown Missoula, the importance of this mountain waterway to native tribes and early settlers will be on display. Both guided tours, which will be roughly 1 hour in length, can only included so many sites. So, using Next Exit History the DMP has added 4 digital tours that will be available to participants. The 41 sites that make up these digital tours will enhance the guided tours by offering historic photos and audio for sites along the tour route. Moreover, the digital tour will be available to visitors during times when the guided tours are not running. Missoula is undergoing a period of growth in the downtown with over $850 million in investment during the next few years. For a community of roughly 60,000 this is unprecedented. The goal of the “Unseen Missoula” is to use the guided and self-guided digital tours to raise awareness of the unique heritage of our community in the face of this growth. With this heightened awareness the DMP hopes to encourage new initiatives aimed at preserving our heritage while embracing economic development. This is the goal of Missoula’s heritage tourism program.